Spring is in the air, and so is harmful pollen to irritate your nose, eyes, sinuses, and lungs. You may have already experienced the common symptoms: watery eyes, sneezing, and a tickle in your throat. 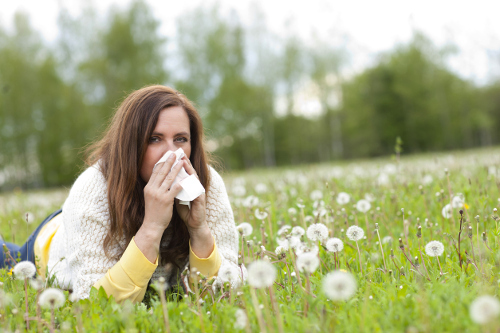 Pollen allergy, one of nature’s seasonal gifts, affects more people than any other allergen. Learn what may be your pollen triggers and popular pollen allergy home remedies. The pollen released from trees, weeds, and grasses invades the human body through the air we breathe. When our immune system senses its presence, a response is triggered in the form of an allergy. Some of us may have a more severe reaction than others. Sneezing, blocked nasal passages, and watery eyes are the result of the antibodies produced by the immune system to fight the pollen. Pollen allergies can appear at any time of the year, but they are most prevalent during the seasonal changes. A large number of allergies are present during the spring season, when the trees begin to sprout buds and flowers re-appear after months of cold, winter temperatures. The severity of the allergy also depends on the cause or trigger of the particular pollen allergy. A pollen allergy, once developed, usually returns, and most allergy sufferers have some type of symptoms for life. Medications, injections, herbs, and certain lifestyle behaviors may help alleviate symptoms. Pollen allergies can appear in various forms, as there are more than 100 different plant species responsible for pollen production. These allergies are also known as hay fever and allergic rhinitis. We will examine the most common types of pollen allergies. Spring season is ideal for the birch pollen allergy. This is one of the more common allergies among allergy sufferers. The birch tree produces up to five million grains of pollen as it begins to sprout its buds. The pollen can travel in the air up to 100 yards, or 300 feet, in distance, settling on objects you come in contact with. The pollen of oak trees also spreads by the air and stays in the atomospehere longer than other tree pollen. The pollen may trigger mild responses in an allergen symptom, but the lasting airtime may result in severe reactions. We love to head outdoors during the summer months, but this is the time when pollen allergies may be at the worse when it comes to grass. The relentless symptoms are usually very hard to treat. A ragweed allergy is at the top of the group with weed pollen triggers. Ragweed pollen can travel in the air over hundreds of miles. You usually see this allergy during the late Spring months running into Fall. The pollen is released in late July through to mid-October in some regions and can withstand the mild winter months. Pollen is a fine powder released in the air by plants, flowers, and trees during the spring, summer, and fall months. It usually appears as a yellow dust that can be seen settled on car and driveways. The wind, animals, and insects easily carry this substance that is intended to fertilize corresponding female plants. Allergies stimulated by pollen affect 25 million Americans each year. Tree pollen, such as that from oak and birch trees, is dominant in the spring season, with grass pollen causing the most havoc in the summer months. Fall is usually the time when weed pollen allergies are at an all-time high. In addition to assessing the symptoms, your medical doctor may diagnose a pollen allergy following an allergy test performed by a trained allergist. The allergist will ask about your medical history and details of your symptoms, including any recurrences of the symptoms. A pollen allergy is confirmed with the results of a skin prick test. With this, your arm will be scratched with various small allergen-infused needles to test your reaction. After 10 to 15 minutes, you will have itchy, red, and swollen skin at the prick mark of the allergen your body reacts to. Small, raised bumps much like a hive reaction may be present. The best course of action is to avoid pollen completely, but as that is not always possible, there are ways to alleviate your reaction to the allergen. Wear a mask on high pollen count days. Keep windows closed on high pollen count days. Avoid the outdoors on dry, windy days. Avoid gardening during the peak of each allergy season. With persistent symptoms, there are products on the market for pollen allergy relief. Some of the medications your doctor may suggest include antihistamines such as Zyrtec or Benadryl and decongestants such as Sudafed or Afrin nasal spray. Actifed and Claritin-D have components of an antihistamine and a decongestant combined. Severe pollen allergy symptoms may be alleviated with an allergy shot. This type of immunotherapy comprises of injections of the allergen given over time. This is intended to adapt your immune system to the particular allergen. For some patients, their allergy symptoms disappear forever within one to three years. Let’s look at some more ways to reduce the chances of contact with the pollen itself. This may help you avoid the severe pollen allergy symptoms. You may love the smell of clothes and bed sheets after drying outside on a clothesline, but this is where pollen exists, even when not visible. You can still enjoy the fresh breeze of a spring and summer day by opening your windows just a little rather than leaving them wide-open. Use the air conditioner instead of opening windows at home and in your vehicle. Change and wash clothes after being outside to avoid spreading the pollen that may have landed on outer layerings. Rinse hair, face, and any exposed extremities with cool water after being outside. Use a dehumidifier or a high-efficiency particulate air (HEPA) filter. Vacuum regularly with a HEPA filter. Wear sunglasses that wrap around the eyes. We have compiled a few recipes that may help alleviate pollen allergy symptoms. Add peppermint and nettle to a cup of the boiled water, and steep for 10 to 15 minutes. Strain and add honey and lemon for taste. Repeat twice daily. Squeeze and combine the juice of the lemon and oranges. Chill in the refrigerator for several hours before adding honey. Drink at least one glass per day. Add the onion to the water and soak for eight to 12 hours. Add a bit of honey and drink one to two glasses daily. Pollen allergies are nothing to sneeze at, as severe symptoms can make you feel miserable. The pollen of trees and plants floats through the air for most of the year causing watery itchy eyes and nasal congestion for many people. It is funny to think that the same trees we need to breath can cause us to gasp for air when our allergies start. While it is part of our natural environment and essential for the reproduction of trees and plants, there are several ways we can try to avoid pollen and still enjoy the wonderful outdoors. “Pollen Allergies,” Healthline; http://www.healthline.com/health/allergies/pollen#overview1, last accessed April 21, 2017. “Pollen Allergies,” Web MD; http://www.webmd.com/allergies/pollen_allergies_overview#1, last accessed April 21, 2017. “5 Home Remedies for Seasonal Allergies (Beyond Local Honey),” Everyday Roots; http://everydayroots.com/allergy-remedies, last accessed April 21, 2017. Shiel, W., “Pollen Allergy, What is It?” Medicine Net; http://www.medicinenet.com/script/main/art.asp?articlekey=20277, last accessed April 21, 2017.